It's never too late to begin orthodontic treatment but when it comes to your youngster's teeth, earlier may be better than later. According to the American Association of Orthodontists, children should have an initial orthodontic screening at age 7. What makes early evaluation, and potentially, early treatment so important? There are several ways that children can benefit from seeing an orthodontist at an early age. But it's important to recognize that early evaluation isn't necessarily followed by early treatment; in many cases, if orthodontic work is eventually needed, we simply monitor your child's growth patterns until we see that it's time for treatment to begin. This gives us the opportunity to get the best results in the most efficient and timely way, and to help prevent future problems. 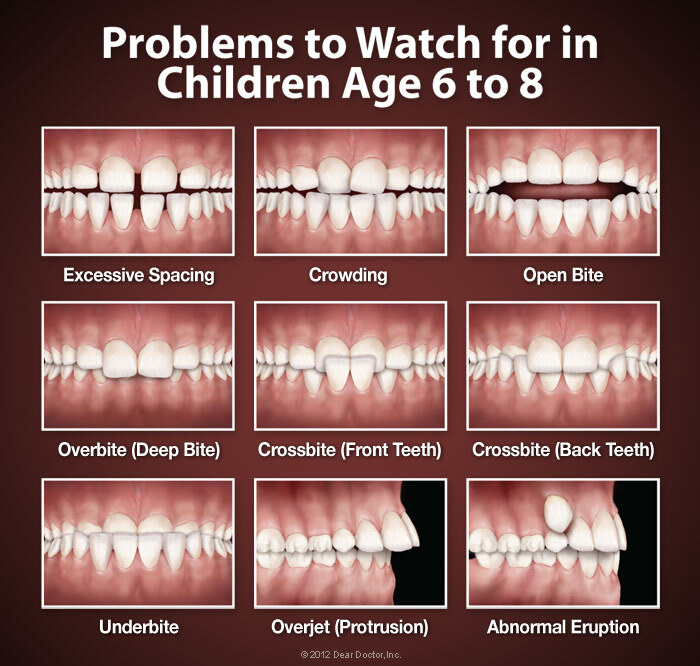 Although every child's development is different, in most children the first adult molars have typically started to emerge by around age six. This, along with other developmental markers, lets us get a handle on the basic alignment of the teeth, from front to back and side to side. It may also be possible at this point to determine whether there is adequate room in the mouth for all of the permanent teeth and if not, to take action. Treatment for common orthodontic problems typically begins around age 12-14, when all of the baby teeth are gone and most of the permanent ones are in place. But there are some conditions that are much easier to treat if they're caught at an early age and we can utilize a child's natural growth processes. Crossbite, is the condition where the upper teeth close inside the lower teeth. To treat this problem, a device called a palatal expander can be used, which gradually and painlessly widens the upper jaw; it's especially effective when the jaw itself hasn't fully developed. If we wait too long, a more complicated treatment or even oral surgery might be required to correct the problem. Another condition that may benefit from early treatment is severe crowding. This occurs when the jaws are too small to accommodate all of the permanent teeth. Either palatal expansion, or rarely tooth extraction may be recommended at this point, to help the adult teeth erupt properly. Even if full braces are required later, the treatment time will likely be shorter and less complicated. Early intervention may also be helpful in resolving several other problems. Protruding teeth, especially in front, can be prone to chipping and fractures; they may also lead to problems with a child's self-image. A severe underbite, caused by the lower jaw growing ahead of the upper jaw, can result in serious bite problems. Orthodontic appliances, can be successfully utilized to correct these problems at this stage, when the child's development is in full swing, thereby diminishing the likelihood that surgery will be necessary. At one time or another, anyone may pick up a bad habit. 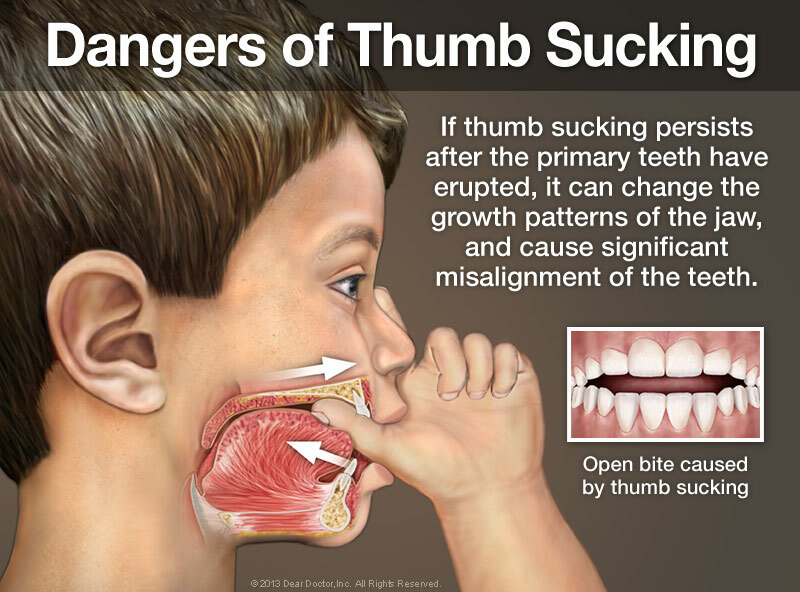 But there are some situations where a youngster's parafunctional (detrimental to health) habits can negatively influence the development and function of his or her teeth, jaws and mouth. 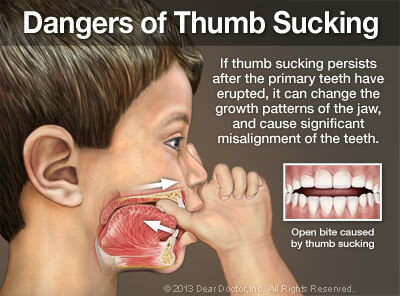 Some examples of these are persistent thumb sucking, tongue thrusting and mouth breathing. The sucking reflex is natural in early childhood; it usually disappears between ages 2 and 4. If it persists much later, the pressure of the digit on the front teeth and the upper jaw can actually cause the teeth to move apart and the jaws to change shape. This can lead to the orthodontic problem called “open bite,” and may impair speech. An open bite can also be caused by the force of the tongue pushing forward against the teeth (tongue thrusting).